Ornate Victorian designs worked well for wicker furniture. This labeled well-preserved Heywood-Wakefield rocking chair sold recently at Neal Auction Co. in New Orleans for ,552. Wicker furniture has been made since the days of ancient Egypt. The cradle for the first American baby born to the Pilgrims was made of wicker. But the glory days of wicker furniture in America started on the docks of Boston in 1844. Cyrus Wakefield, a grocer, noticed volunteers taking away the rattan used to tie the ship’s cargo. He thought it would be a good material for furniture, so he experimented with the rattan and found it worked for chair parts and seats. He started importing rattan and selling it to others. The business grew and Wakefield began importing cane, the strips of bark from the rattan palm tree stalks, and rattan. Wakefield continued to experiment and made furniture with bentwood and rattan fancywork. He worked with a machine that split the bark and used it for chairs, tables and other furniture. He was the country’s leading maker of wicker furniture by the 1870s. 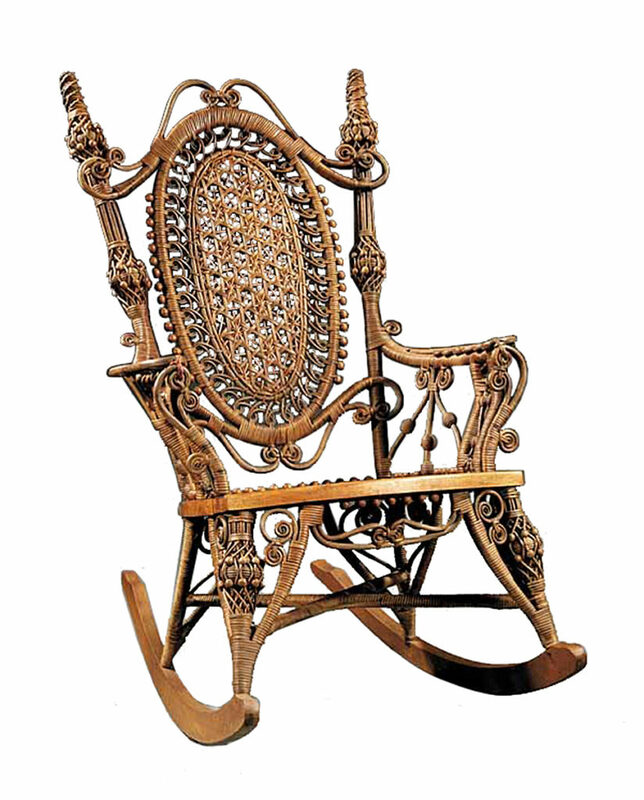 Cyrus Heywood, a 19th-century chair-maker, began using wicker, too. He owned a loom that wove cane into sheets to make set-in seats. The two companies were rivals until they merged in 1897. The popularity of ornate Victorian styles and Japanese designs helped increase sales of wicker furniture. But tastes changed in about 1900. The straight lines of Arts and Crafts furniture, the introduction of forced-air home heating (which dried out wicker) and new furniture styles created by Austrian designers changed the way manufacturers used wicker. By the 1930s, wicker furniture was scorned and Heywood-Wakefield was making light-colored wooden furniture in new simple modern designs. Wicker did not regain its popularity until the 1990s. Q: I have a blue-and-white cup and saucer I received as a wedding gift. The pieces each have a stamped mark on the bottom with “R & M Co.” inside a diamond. They are decorated with pictures of musicians and composers. Haydn, Gounod, Wagner and Meyerbeer are on the cup, and Beethoven, Mozart, Liszt, Handel, Chopin and Mendelssohn are on the saucer. Can you tell me when the cup and saucer were made and how much they’re worth? A: Souvenir plates and cups were very popular from the 1890s until World War I and picture famous people or show scenes of famous places or historical events. They are often marked with the maker’s name, the importer’s name or both. Your cup and saucer were originally sold by Rowland & Marsellus, a New York City importing company in business from about 1893 to 1937. Rowland & Marsellus imported plates, cups, saucers, vases and other items from different potteries in the Staffordshire district of England, but the items were marked only with the Rowland & Marsellus mark. Your cup and saucer are worth about $100. Q: When was the first Frisbee made? I collect plastic Frisbees with advertising or other decorations. A: The metal pie tins used by the Frisbie Pie Co. of Bridgeport, Conn., were the inspiration for the toy we know today. It is said that bakery workers took breaks and went outside and played catch with the tins. Soon some college students also played with the tins. But perhaps the real beginning of the Frisbie came in the mid 1940s. Walter Morrison and Warren Franscioni started Pipco in Los Angeles and made disks of plastic they called Flyin’ Saucers. They began demonstrating the toy on beaches and started selling it, but money problems closed the company. In 1953 Morrison formed his own company and sold a similar toy named the Pluto Platter Flying Saucer. The Wham-O company made a deal with him and began to sell the toy. College kids called them “Frisbees,”and eventually the name stuck. The plastic disc sold by Wham-O changed its name to Frisbee in 1956. Since then, millions of Frisbees have been sold and Walter Morrison became rich. He died in February at the age of 90. Q: I found several old stock and bond certificates in my attic and wonder if they are still worth anything. The stock certificate is for 20 shares of Polish American Navigation Corp., issued in 1920. There are two $50 bonds that were issued by the National City Bank of New York for the Republic of Poland in 1920 and due in 1940. Are these still worth something, or are they valuable just as collectibles? A: The Polish American Navigation Corp. operated cargo and passenger ships between New York and Danzig (now Gdanz), Poland, between 1919 and 1921. The company closed in January 1922. The National City Bank of New York is now part of Citigroup. Your stock and bonds probably have minimal value as collectibles since they are not ornately decorated, elaborately engraved or signed by a famous person. There are companies that specialize in researching old stocks and bonds; they charge a fee. They also may be interested in buying the stocks and bonds. You can do the research yourself, if you’re ambitious. Try your library. Look in the Directory of Obsolete Securities (Financial Information, Inc.) or Capital Changes Daily (Commerce Clearing House). You also can contact the U.S. Securities and Exchange Commission at SEC Headquarters, 100 F St. NE, Washington, DC 20549 or online at www.sec.gov/answers/oldcer.htm. Even if the certificates cannot be redeemed, they may have value as decorative art. Tip: Don’t dry your china and crystal with a cloth that has been laundered with fabric softener. The softener may leave a film. — Terry Kovel answers as many questions as possible through the column. By sending a letter with a question, you give full permission for use in the column or any other Kovel forum. Names, addresses or e-mail addresses will not be published. We cannot guarantee the return of any photograph, but if a stamped envelope is included, we will try. The volume of mail makes personal answers or appraisals impossible. Write to Kovels, (Kovel’s Antiques), King Features Syndicate, 300 W. 57th St., New York, NY 10019. • The Karo Cook Book, soft cover, spiral bound, Karo Syrup recipes, 125 pages, 1981, $13. • Kewpie tobacco felt, Rose O’Neill Kewpie riding a fish, wearing red flag bow, turquoise background, sky, clouds and waves, 1914, 6-by-4 3/4 inches, $30. • Disney Mickey Mouse and Donald Duck alarm clock, see-through movement, Mickey and Donald ring yellow bell for alarm, Bradley, $125. • Walt Disney School Bus lunchbox and Thermos, metal with dome top, Disney characters, 1968, 8-by-9 inches, $140. • Sasha Schoolgirl doll, blond hair, dressed in school uniform, cotton blouse, gymslip with sash, long socks, 1970s, 17 inches, $300. • Quilt, flower baskets, blue-and-brown cotton, pink tinted ground, 1920s, 82-by-70 inches, $330. • Meissen porcelain platter, square, hand-painted floral spray, gilt trim, open handles, shell corners, marked, 1920s, 15 3/4 inches, $400. • Soapine washing powder hanging sign, die-cut, image of company’s black whale trademark, two men washing whale with long-handled mops, 19-by-6 inches, $440. • Tin squirrel cage, house form, dome roof, sliding door on side, rotating wheel, wooden base, soldered joints, mid-19th century, 16-by-31-10 1/2 inches, $480. • Biedermeier-style sleigh bed, maple, ebonized accents, scrolled head and foot boards, ebonized rondels, block plinth feet, 1950s, 47-by-96-by-81 inches, $1,015.